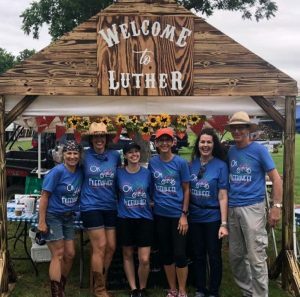 Participants of the 2018 Oklahoma Freewheel voted Luther “Best Host Town.” Luther was the third stop on the annual ride across the state during the week of June 10 – 16. 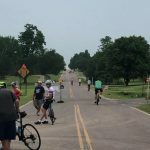 This year’s route celebrated Route 66, with cyclists from Oklahoma and many other states participating on the route from Elk City to Joplin. Steward said the riders voted for the best host town during the End-of-Trail dinner and Talent Show. “The vote is simple. What host town did you like best? There is no breakdown for food, services, and other accommodations,” he said. The bicyclists rolled into town after a morning thunderstorm to find members of the local Boy Scout troop had moved their bags to shelter to keep them dry, and other volunteers helped the Freewheel guests settle into their tents on school grounds. Luther Public Schools also offered their multi-purpose facility for campers wishing to sleep indoors. Speaking of tents, donations from BancFirst, Haskell Lemon Construction Company, Airosurf Communications and OG&E helped pay for the rental of the “party tent” where Freewheelers could enjoy entertainment from DJ Shorty B, live music and food from fundraisers to support the cheerleaders and firefighters. The Luther Parks Commission organized the welcome. Begun less than a year ago, the Parks commission works to improve the community by seeking grants, and delving into promotional activity. Current commission members are Kasey Wood, chair, along with Summer Shelton, Ashlee Webster, Dr. Rosemarie Strong and Chris Ivich, along with Mayor Jenni White. The Chicken Shack had a waterslide and invited cyclists to sign the old 66 bridge. The 116 Farmstead, Market & Table and Josephine’s Cafe stayed open late and opened early. DJ’s Barbecue and The Boundary took food to the campsite, and retailers welcomed the increased traffic. 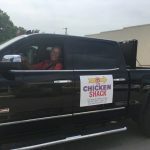 The fire department, Eastern Oklahoma County Partnership, football players and students volunteered for the event that lasted less than 24 hours. It was a lot of work, but a lot of fun, most said. It was an effort to show hospitality and have a return on investment for welcoming back visitors, and improving the Town’s reputation. One Freewheel cyclist remembered Luther not so fondly from a ride 19 years ago. She said that although Luther wasn’t an official stop, a severe thunderstorm came through and some cyclists sought shelter at the Post Office. 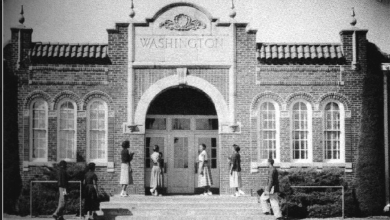 She recalls they were kicked out of the lobby and sent back into the lightning and rain. 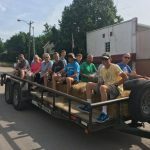 She said she thought of that every time she heard about Luther, and this time said it looked like the whole town had come together to welcome them. She was impressed. “What an amazing effort by businesses and volunteers alike! Just outstanding! 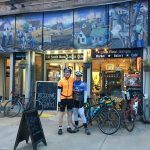 THANK YOU FREEWHEEL CYCLISTS! 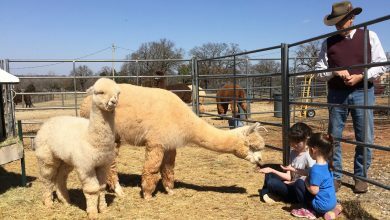 You’re always welcome here in our friendly town of Luther,” said Mayor White. 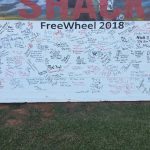 The 2018 Oklahoma Freewheel won’t be back this way for a while as Steward said new routes are chosen every year to celebrate the whole state. Way way to go Luther!!! Luther rocks. Come visit us!